We found this in the attic of an old rental home. Yes of course we looked for the rest of it but no such luck. After years of searching for its identity we were finally filled in at a local gun show. I am not intrested in trying to assemble and source the NFA parts of this gun and I'm hoping it will generate interest here so we can help preserve a historic firearm. Tell me about it! I'm not terribly familiar with mid century police subguns but I am a decent war and firearms buff. If you didn't know what an M6 is you would be hard pressed to ID it either just by local gun shops and the internet. Try it! 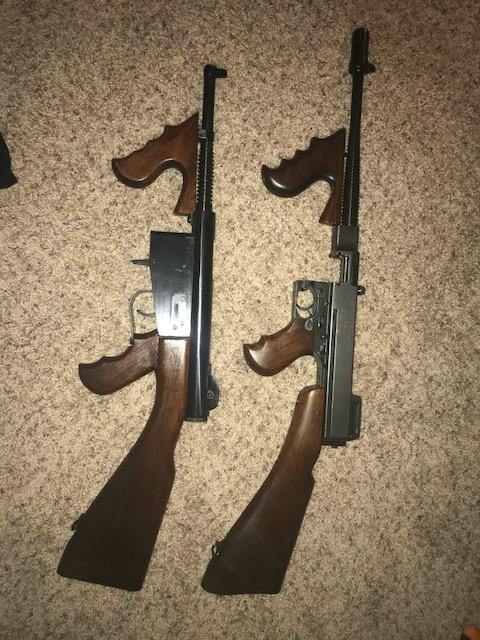 Do a google search for "similar to Thompson but not" or submachine gun lower with wood". So last weekend we went to the Bill Goodman gun show in Lebanon TN. Ever heard of a Youtube personality named hickok45? Very popular and well versed guy who has done gun reviews for many years. Super friendly too,well he was there and after introducing myself as a fan I showed him the part. He was stumped too. I spent the rest of the day enjoying the show when right at the end a guy came up to me and asked if I knew what I had. Imagine my relief. I honestly feared with the industrial look of the steel that it might be a carnival shooting gallery prop or even an old toy! Edited by kbegue, 08 June 2018 - 09:15 PM. M6 smgs stand out in one regard: the selectfire design is second to none in it’s smplicity. Just two parts, trigger and sear, provide FA or semi fire including partial trigger pull for semi and full pull for FA. Brilliant design. A gun whose time never arrived. Edited by huggytree, 09 June 2018 - 02:29 PM. Actually the trigger design does not stand out so you can scratch that. That was done in the 30's by the Germans of course. Never took off there either? Edited by johnsonlmg41, 10 June 2018 - 08:38 AM. one issue..when i fire it the sear drops, but doesnt do the click....my guns lower when you pull 1/2 a pull the sear drops and snaps back up...with a full pull it still makes the snap noise but stays down...on this lower the sear simple drops...it doesnt get to the 2nd shelf on the sear...i took it apart/ cleaned/inspected it....without grabbing my gun out of the safe and dissembling im not sure whats wrong?